For years, housing development in San Mateo County has not kept up with the thousands of new djobs added, and the problem has gotten worse in recent years. This jobs-housing gap drives up the cost of housing for homebuyers and renters alike, produces congestion and long commutes for workers, and forces our friends and family members to move away because they can no longer afford to live here. 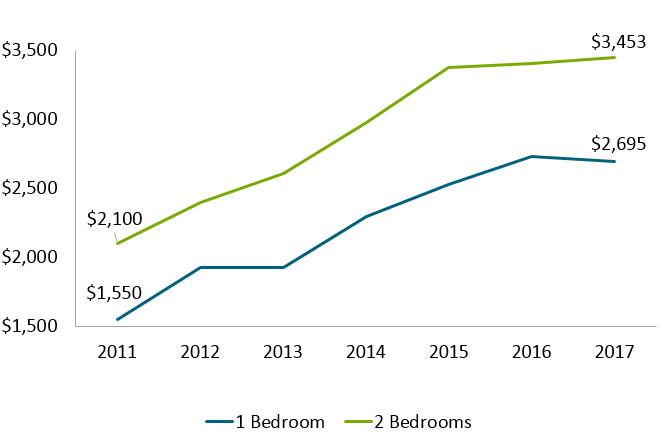 Between 2010 and 2017, 83,000 new jobs were created in San Mateo County, while only 7,100 new housing units were built, a 12:1 ratio. 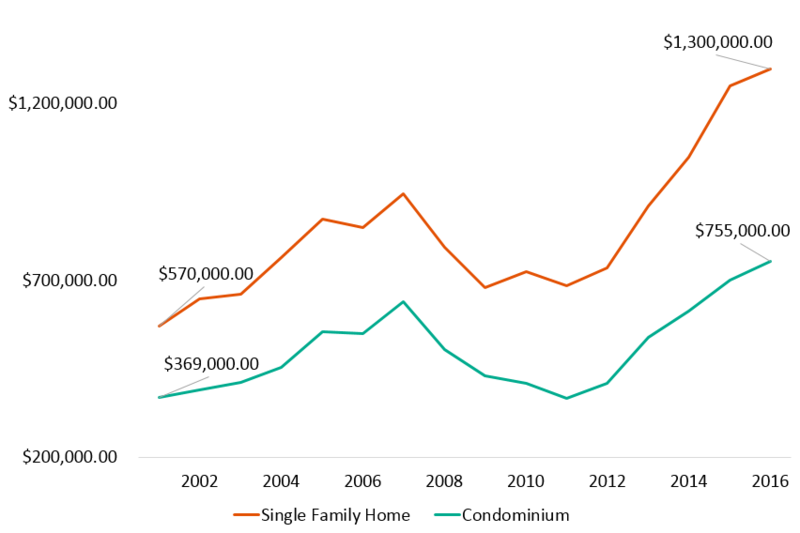 Generally, San Mateo County has not produced as much housing as other inner Bay Area Counties. The ratio is decreasing, but we still have a long way to go. 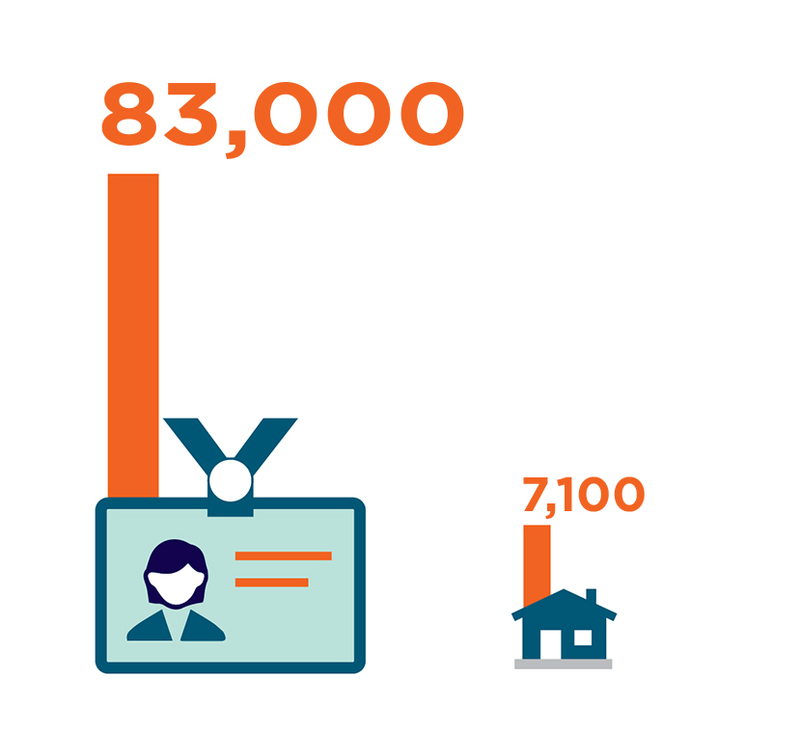 Source: CA EDD, US Census, American Community Survey. Despite significant jobs losses during the dot-com bust and the Great Recession, overall, San Mateo County job growth has far outpaced housing permits over the past decades. Source: EDD, ABAG, and State of California Department of Finance, from memo by 21 Elements, Joshua Abrams, Baird + Driskell Community Planning. In a 2018 poll, residents cited housing costs as the top problem facing the region, with 46% of respondents likely to leave the Bay Area in the next few years. Source: Bay Area Council poll. 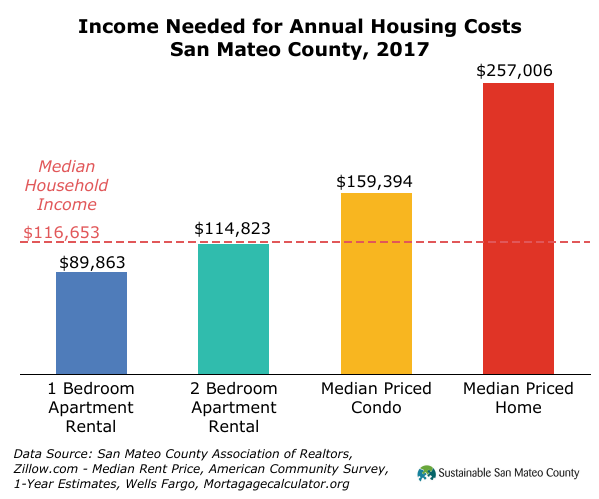 In San Mateo County, a renter needs to earn at least $114,823/year to afford a typical 2-bedroom apartment, and most condos and homes are out of reach for median-income families. Source: Sustainable San Mateo County, SMC DOH, updated November 2018. 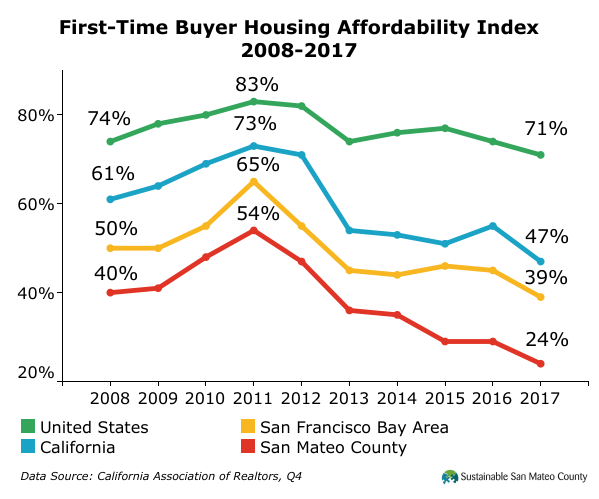 Source: Sustainable San Mateo County, California Association of Realtors Q4 2017 data. Only 24% of San Mateo County households can afford an entry-level home (85% of median sales price), and even fewer can afford the median-priced home in the county. 62% of San Mateo County commuters cross county lines. This is significantly higher than the portion of workers commuting outside their home county in Santa Clara County (31%), San Francisco (46%), and the Bay Area as a whole (49%). Source: U.S. Census Bureau. 2014 LODES Data. Longitudinal-Employer Household Dynamics. As a consequence of the job-housing gap and the high cost of housing, San Mateo County has high rates of in- and out-commuting, producing long commutes and traffic congestion for residents and workers.